The athleisure trend has helped the acceleration of growth, as has social fitness, which will continue to shape the sports business as class-based fitness activities and other shared experiences will dominate the industry. The U.S. athletic footwear industry grew by 8 percent in 2015*, generating $17.2 billion and marking one of the best performances the industry has had in a number of years, according to global information company The NPD Group. Unit sales grew by 3 percent and average selling price by 5 percent, to $61.15. The strongest growth of the year came from the $3.5 billion Classics category, which grew by 30 percent in 2015 and is capturing share from other major categories. This growth was driven by retro basketball and retro running shoes. The Classics trend is evident among all consumers, as the category showed substantial sales increases among men (+26 percent), women (+69 percent), and children (+29 percent) alike. 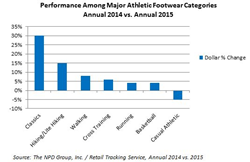 Coinciding with the holiday season, athletic footwear sales peak in December. The final month of 2015 was one of the best in terms of sales growth for athletic footwear. Total dollar sales grew 13 percent, unit sales by 10 percent, and average selling price by 3 percent compared to December 2014. Classics experienced the strongest growth during this time as well, with a 63 percent rise in dollar sales.